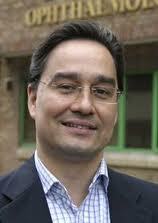 Robin Ali is Professor of Human Molecular Genetics at UCL Institute of Ophthalmology. He is also the Theme Leader for Gene Therapy at NIHR Biomedical Research Centre for Ophthalmology, Moorfields Eye Hospital and Director of the UCL GMP gene therapy vector manufacturing facility. He is a Visiting Professor at The Kellogg Eye Center, University of Michigan and Founder and Chief Scientific Officer of MeiraGTx Ltd, a gene therapy company with offices in New York and London. The main focus of Robin Ali’s research is the development of gene and cell therapy for the treatment of retinal disorders. Robin Ali and members of his team have received numerous prizes and awards for their work on developing new treatments for retinal degeneration including the Pfizer /ARVO Karl Camras Translational Award in 2010 and Alcon Research Institute Award in 2009. In 2007 he was elected to the UK Academy of Medical Sciences and in 2009 appointed Senior Investigator of The UK National Institute of Health Research. He is President-Elect of the European Society of Gene and Cell Therapy and has served on the advisory boards of a number of funding bodies including the UK Medical Research Council (Neurosciences and Mental Health Board and the Regenerative Medicine Research Committee), Research to Prevent Blindness USA and Fighting Blindness Ireland, as well as the advisory boards of a number of pharmaceutical and biotech companies. Robin Ali obtained his BSc (1988) and PhD in Genetics (1993) at University College London, continued by postdoctoral training at the MRC National Institute for Medical Research and UCL Institute of Ophthalmology and established his laboratory at UCL Institute of Ophthalmology in 1999.